Other rooms in my house, like the office, laundry, and dining room, have really been coming together lately. They’re pretty and functional and make me happy. But the master bedroom is just a little…off. Something about it just doesn’t feel complete. I think the artwork above the armoire is not working. Perhaps I’ll paint the frame of the peacock print and move it over to the left side of the bed to replace those two tiny frames. And maybe a different chair and nightstand over there would help. And I hate to say it, but I think we need a rug. I really don’t want to spend a lot of money because we don’t spend much time in here except for sleeping. But I think a little effort is worth it to have a bedroom that feels like a place I’d like to be. This is definitely the biggest bedroom I’ve ever had. It’s a loft that was added on to our house sometime shortly after its original construction. The floors are a little different but it’s got the same four-over-one wavy glass windows (12 of them, if you include the bathroom!). The dressing table on the right side of the bed was a major improvement, so I’m hopeful that getting a wider nightstand to replace the small, low one on the left can help things feel less like they were thrown together from the thrift store (which, um, is what actually happened). I’ll keep my eyes peeled for a secondhand chair at a great price, and maybe in a few months I could order another one of those big indoor-outdoor rugs like we have in the living room (see it here). Is it weird to have the same rug in two rooms? The price was great and the colors would work. Try putting the bed at an angle to the corner. 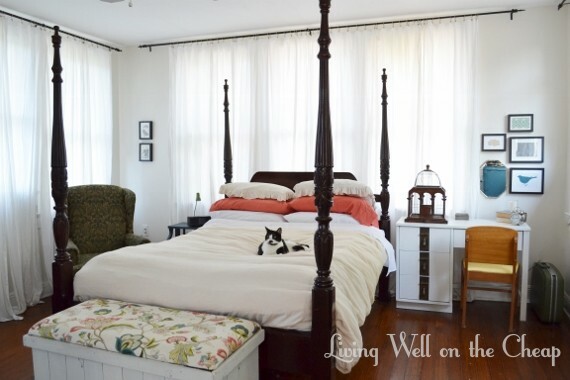 It’s unusual, unexpected, but often angling the bed to a corner in a large room will improve flow. You’d probably need to change up the corner artwork a bit, but I think you might feel better about the room if the furniture was arranged differently. I’ve thought about rearranging the furniture, and that’s definitely an interesting idea! My bedroom is throwing me off too, lately. It was the first room I “completed” in my condo, and lately its felt…blah. I’m having company in a few days, and I wanted to dust REALLY GOOD, so I took everything off the walls and surfaces, and though its not exactly what I want, I like the minimalism better. Just a thought, that maybe looking with a clean palette may help. Ooooh I should do that! I feel the same way about our bedroom! Everywhere else in the house is so much easier to figure out, but for some reason our bedroom is the one I still don’t really know what to do. I bet eventually we’ll both figure out the right look Ps. I love all the windows and how much light you get in there! That headline will get people reading. Ha! LOL I’m all about the double entendre. I’ve finally figured out what it is that draws me so much to your blog and your house. And it’s going to sound ridiculous, but I promise I totally mean it as the best compliment. Your house just looks so cozy it’s like going to my grandma’s house. . . but with just enough twists of modern, trendy style to make it look fresh. 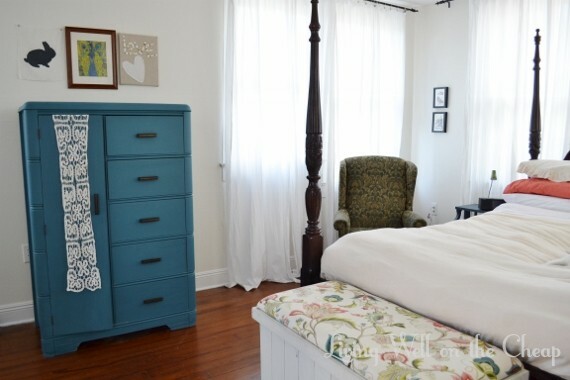 I love the infusion of classic pieces like your bed, antiques and thrift store finds with fun, unexpected pops of color like the teal in the dresser. Those modern twists make the house comfortable rather than stuffy. 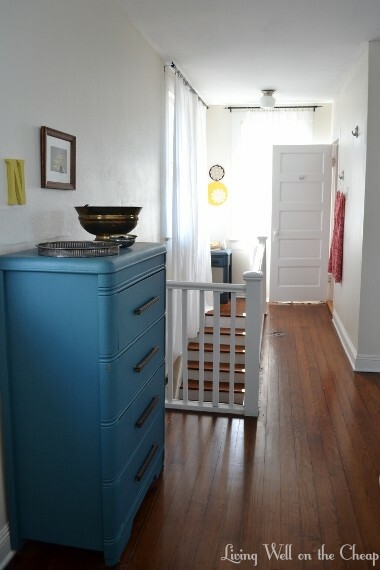 I’m obsessed with the reupholstered hope chest at the foot of your bed. I think you’re right about finding a wider end table for the left side of your bed to help balance out the chunky dressing table on the right side. Honestly, I didn’t even notice there was a table there until you said something. Jessica, I’m blushing! That’s exactly the feel that I try to create. Thanks so much for your kind words!